Open access to scholarly research can be achieved by a range of activities around publishing and dissemination of scholarly research outputs. This includes dissemination of preprints and grey literature through repositories and platforms, known as “Green” open access; and publication of articles in peer reviewed journals, known as “gold” OA. It also includes the sharing of data associated with research outputs. For research outputs and data to be truly reusable, they need to be appropriately licensed. This is where Creative Commons comes in – an open licence is the difference between research outputs being available for free on the internet and being free to re-use. Initiatives to share scholarly outputs are detailed in Peter Suber’s timeline of OA including notable milestone platforms such as Project Gutenberg Joint Academic Network. OA is commonly associated with research outputs expressed in journal articles, but many researchers are increasingly publishing open access books and textbooks. The movement to extend OA to longer-form works is being led by university presses and collaborative funding initiatives such as Knowledge Unlatched. For more information see Developments in OA monograph publishing by the Australasian Open Access Strategy Group (AOASG). CC licences provide the legal mechanism to provide permission for a range of reuses from sharing to making derivative works, while at the same time protecting the moral rights of authors to be attributed. CC also offers copyright owners a public domain dedication tool – CC0 – which provides a legal mechanism for an author to waive the right to attribution and other copyright interests, effectively dedicating a work to the public domain. Creative Commons Licences: What do they mean to Authors & Users? OERs include but are not limited to textbooks. As with other OA publishing, OERs are communicated on the internet and enabled for re-use using CC licences. Learn more about Creative Commons and OERs here, and OER in Australian schools here. Two licences meet the requirement for open access as defined by the BOAI. SPARC and PLOS have created a useful spectrum- HowOpenIsIt?– for evaluating open-ness based on reuse rights. The Directory of Open Access Journals (DOAJ) identifies peer reviewed journals that meet the criteria for open based on the journal licence. 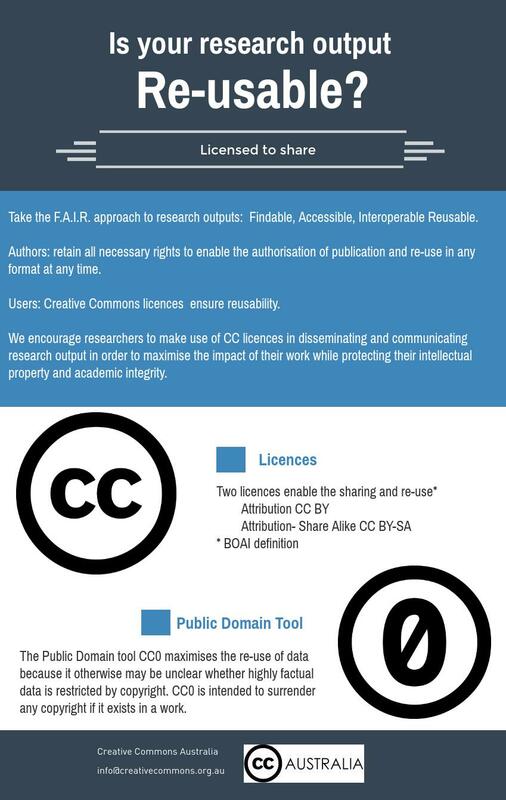 Creative Commons (CC) licences provide a simple mechanism to ensure that users of research have the rights they need to reuse, replicate, and apply research outputs and data. The four FAIR characteristics were originally identified as qualities for open research data. The Australian National Data Service (ANDS) has developed FAIR data training resources. 4 ways to mark your work to show you share! Is your research output Re-usable?